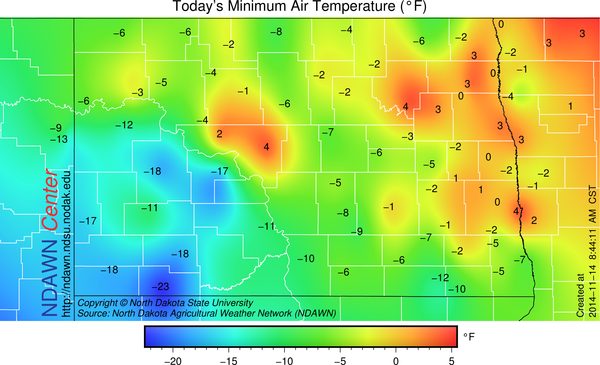 Low temperatures this morning across the NDAWN weather stations included a -23° reading at our Hettinger station. Many -10s were recorded in locations that received at least enough snow to cover the grass on Monday. 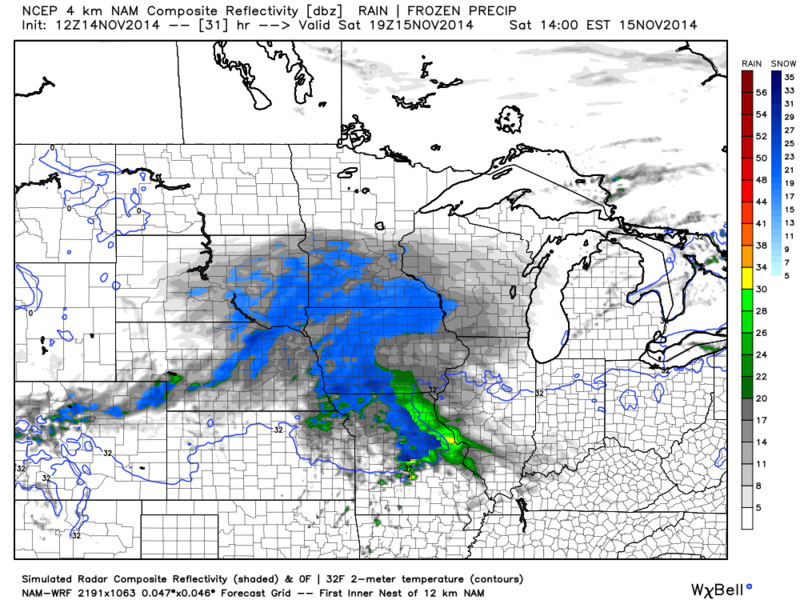 There will be another grass covering event, but off to the south of North Dakota on Saturday. It appears that approximately two to four inches of snow will fall near the Interstate 90 corridor late tonight into tomorrow, with lesser amounts as you move north away from that line. Far northern South Dakota will likely record little or a dusting of snow and at the moment it appears North Dakota will be too far north for any accumulation although the border with South Dakota will have the potential for some flurries. 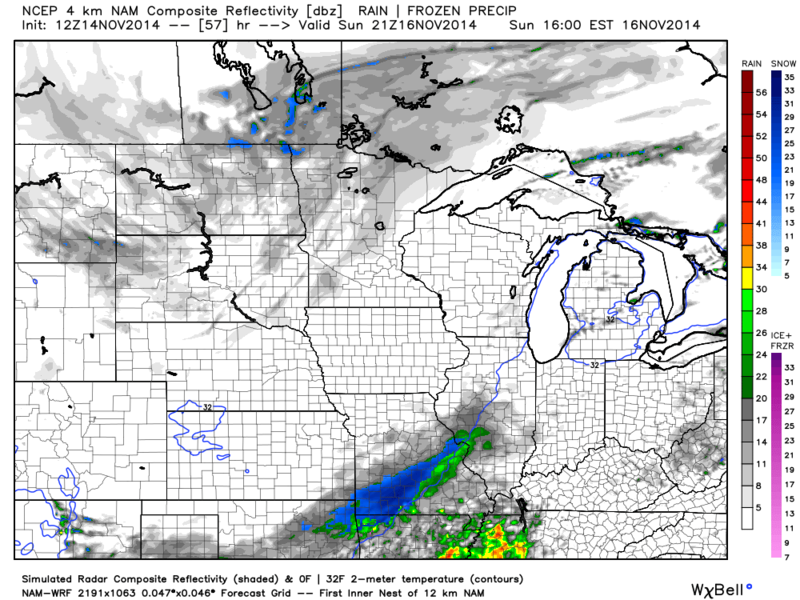 There will be another system with better snow potential in North Dakota on Sunday. Although, snow amounts look quite light, the system on Sunday will drawn in a reinforcing shot of cold air with a cold frontal passage. That feature should also help whip up the wind. Wind gusts in excess of 30 mph seem reasonable to assume at this point, meaning, areas will substantial snow cover in far southern sections of North Dakota may in turn have a blowing snow scenario during that day impacting travel. 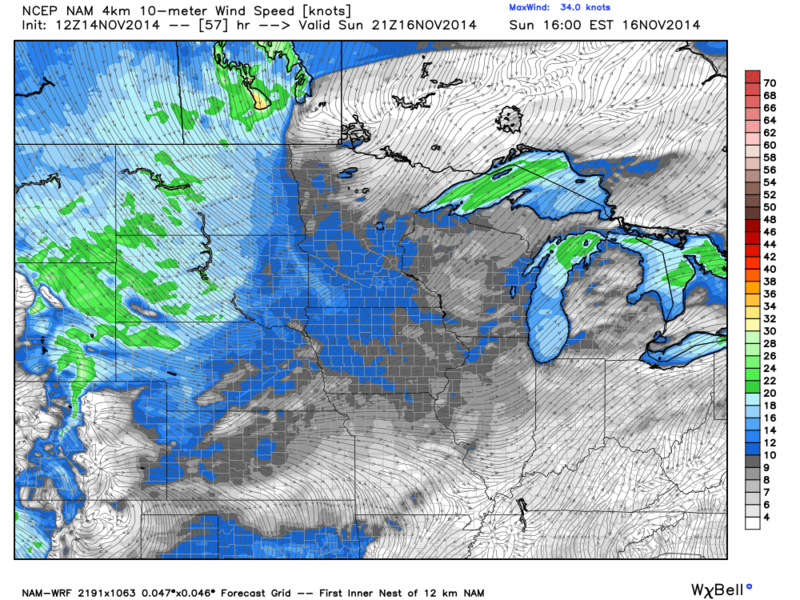 Projected Wind Direction and Speed at 3 PM Sunday, November 16, 2014. Snowfall amounts from the event on Sunday appear to be in the one inch or less range for a majority of the state. But even a light coating in combination with the wind could cause some travel problems, plus the locations with the higher totals already on the ground would be the areas with the most concerns. After that Sunday front moves through, colder air will return back into the region. Slightly warmer, albeit still below freezing, temperatures are foreseen this weekend before the frontal passage on Sunday. Falling temperatures or at a minimum steady temperatures are projected for Sunday afternoon. Next Monday through at least Thursday will be back into the well below average category. Any possible warm up will hold off until the following weekend of November 22 and 23.